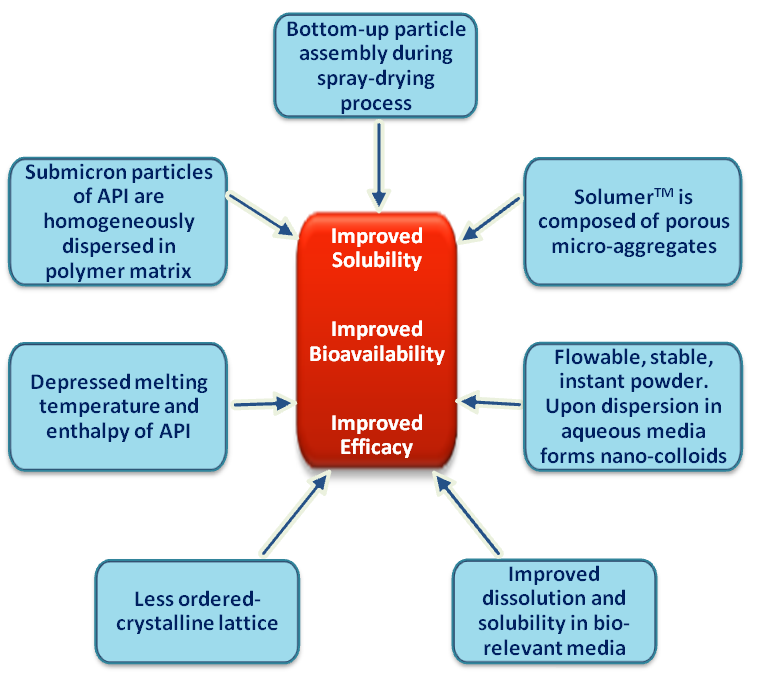 The Solumer™ technology platform offers a significantly improved solubility of challengeable compounds. The technology has a combination of distinct characteristics which clearly differentiate it from other competitive technologies. To explore the characteristics of SolumerTM in detail, press the figure. SolumerTM technology facilitates the improvement of the bioavailability of poorly soluble drugs (BCS II and IV). It is based on a "Bottom-Up" process, whereby the dissolved polymer and active components in a liquid feed self-assemble into particles during the course of drying. The resulting powder demonstrates a significantly improved dissolution and bioavailability of the active compound. The Solumer™ platform can be applied to a wide range of active ingredients rapidly and cost effectively. It may be implemented for formulation development in multiple areas such as pharmaceuticals, agrochemicals, food supplements and nutraceuticals. Feasibility studies can be promptly conducted and the process can be readily scaled up for pilot and industrial scale production. More about Solumer™ technology implementation can be found here. Sepomer- A novel platform which converts oil based actives into an instantly nano-emulsifiying powder. Upon contact with aqueous media (as can be found in the gut), the powder turns into a nano-emulsion, which exhibits improved absorption due to the radical increase in the actives’ surface area. Three products are currently in development using this platform—two in the agro-chemistry field, and one nutraceutical preparation. Lipomer- Hydrophobic coating unstable hydrophilic actives. Allows for prolongation of shelf life and maintenance of bio-activity. Contromer- A controlled release platform which uses modulated in-tissue biodegradation. The result is the prolongation of activity (from several hours- to up to 30 days) and low variability, directly impacting patients’ compliance.